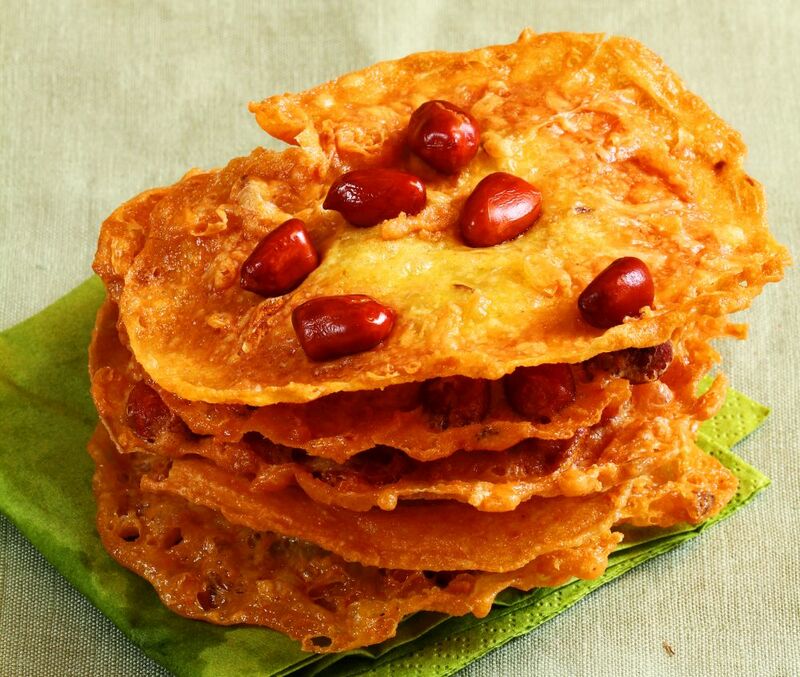 Make this classic crunchy Malay snack Rempeyek to add to your Hari Raya spread. This recipe was first published in Flavours magazine. Mix the two flours into a bowl, then add in the ground ingredients and salt. With a whisk, mix in the egg, santan and water. Heat 250ml oil in a small wok on medium-low heat. Using a small ladle, scoop the thin batter and sprinkle a few peanuts onto the ladle before pouring into the heated oil. Cook until just set then remove from wok. Drain and repeat till finished. Heat 750ml oil in a larger wok over medium-high heat. Add a few set rempeyek and fry, turning over a few times until crispy and brown. Remove from heat and drain. Repeat fill finished.